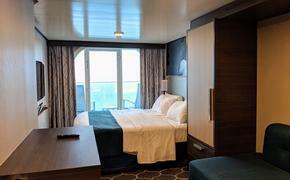 Hoping to appeal to families, Crystal Cruises on June 4 will debut nine new connecting staterooms on the Crystal Symphony. Several of the connecting rooms offer sofas as third berths to accommodate parents with more than two children. Crystal is refitting 18 verandah and deluxe outside staterooms so they can be connected when desired. The accommodations are in several stateroom categories, in addition to two existing Penthouse Suite/Penthouse and Verandah combinations. Of course, connecting rooms aren’t limited to families with children; they can also be requested by adults traveling together who prefer their own rooms. All-inclusive fares for Crystal Symphony’s 2013 voyages start at $1,630 if booked by June 28. In 2012, Crystal saw the number of family groups increase 20 percent over 2011. Underscoring that trend, as of March, the line has more family groups booked to date for 2013 than were booked for all of 2012. Crystal’s Family Memories program offers free berths, shore excursion credits and other amenities for family groups. The ships have purpose-built playrooms and video game rooms for junior cruisers, who primarily sail during the summer and holidays. On cruises with more than 10 children, Junior Activities Directors supervise games, crafts and behind-the-scenes learning programs, including how to make sushi from Nobu-trained chefs.